Ice therapy is not just a home remedy but a medically proven technique for reducing inflammation and pain. It is beneficial for athletes with major injuries, but also for those, such as marathon runners, who place an above-average strain on the muscles and tissue in their feet. Most people perform this therapy with ice, but you also can use cold packs, snow or even very cold water. After a long period of stressful activity, regardless of whether you have sustained a serious injury, your feet may become sore and swollen. According to "Running Times" magazine, an ice bath is one of the most effective ways to reduce this swelling, promote muscle health and protect against injury. Many runners submerse themselves in ice water from the waist down to treat sore leg muscles. According to "Running Times," every muscle group, including the muscles on all sides of your feet, experience the same deep-muscle and tissue benefits. However, this treatment is controversial among medical scientists. For example, an article published in the British Journal of Sports Medicine found no connection between ice bathing and delayed-onset muscle soreness. In fact, among untrained individuals, it seemed to increase their soreness. 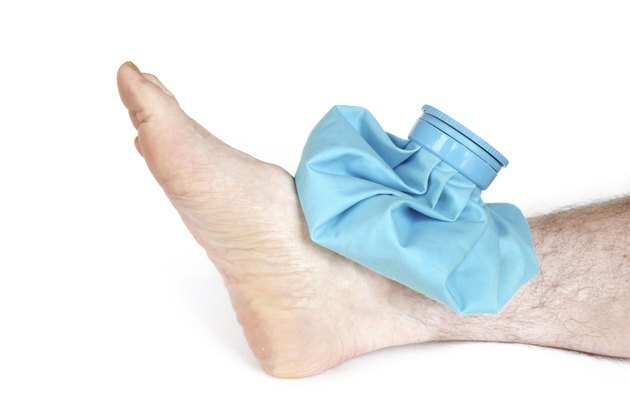 According to MayoClinic.com, the best way to treat a foot injury that results in mild to moderate swelling is to apply ice for 15 to 20 minutes three times per day. You can use ice in a resealable bag, frozen fruits or vegetables or a cold pack filled with a refrigerant gel. Whichever method you choose, wrap the bag or cold pack in a thin layer of cloth or a paper towel to increase comfort and protect against frostbite. Do not apply the ice for longer than 20 minutes at a time. Several shorter treatments are more effective than one long one. For more serious injuries, the American Podiatric Medical Association recommends that you apply the ice for 20 minutes with 40 minutes between applications until you can reach medical help. Ice constricts your blood vessels, which inhibits the fluid buildup that causes inflammation and pain. The APMA discourages using heat on an injury, since heat has the opposite effect. Icing your foot does more than make you more comfortable. After removing the ice, your veins and arteries expand, causing your blood to flow through the effected area more quickly. According to David Terry, a doctor and long-distance runner, this helps flush the by-products of cellular breakdown from your foot. MayoClinic.com and the APMA discourage the use of ice alone to treat an injury. This therapy is most effective when paired with rest, compression and elevation. When you have a swollen foot, you should stay off of it as much as possible until the pain and swelling subside. After you ice it, you also should wrap it securely with an elastic bandage, which helps to further reduce the swelling. Wrap it snugly but not so tightly that it impedes the blood flow. Keep it propped higher than the rest of your leg on a pillow or chair. If these measures do not reduce the swelling within three days, or if the area becomes hot, numb or tingly, call your doctor to schedule an appointment.